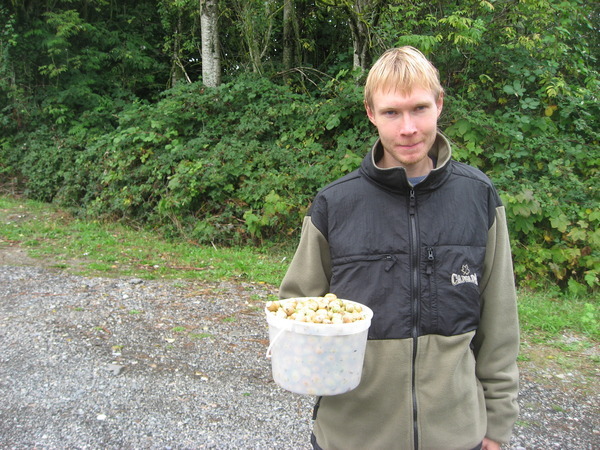 A few weeks ago on a raining Sunday morning I ventured out to Abbotsford with Oliver to go pick some hazelnuts. I had found a farm online (Garside’s Fruit Farm) that did u-pick, and after a quick call to confirm they were open and had nuts we were off. In less than an hour we were at the farm, a few short turns off highway one. The sign for the farm was a little small, but the very straight, very local road we were on made it easy for us to turn back around after we totally missed it. Once at the farm we went up and knocked on the door at the house. A nice elderly gentleman (Richard?) 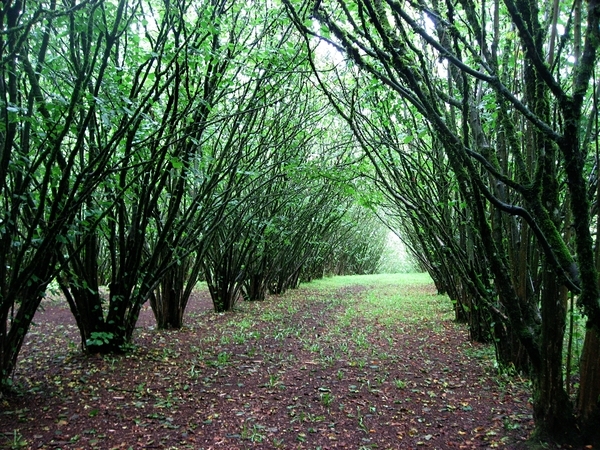 answered the door and pointed us in the direction of the hazelnut grove. He gave us a few rakes and some carpet to kneel on, which I thought was really nice of him. 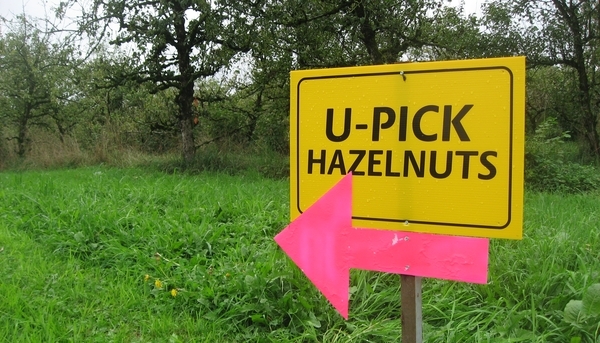 Just as we headed out towards the hazelnuts it began to rain again, which was a little unfortunate, however we decided to stay and pick anyway. At first the picking wasn’t easy. There were a lot of empty shells from the past pickers, and it was difficult to spot shells that would contain any nuts. After about 20 minutes however I began to develop my eye for the nuts. My mom always talks about how she has to train her eyes every season before she goes pine mushroom picking, and I think this was much the same. 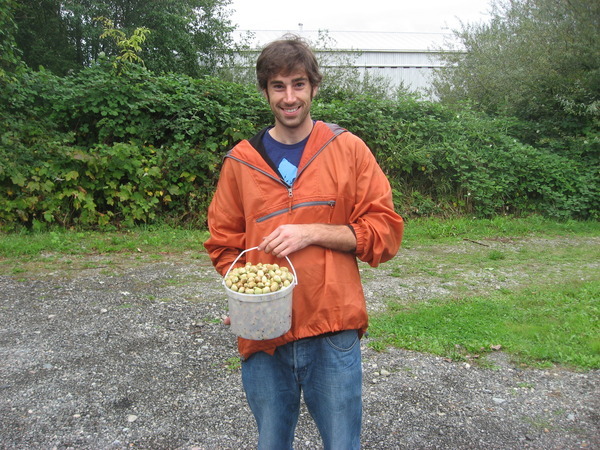 The hazelnuts at Garside’s farm were a little different than I was used to. My parents have a big hazelnut tree in our front yard, however it is much larger than the trees at Garside’s, as well the nuts at my parents were rounder and smaller. I imagine they must be different varieties. 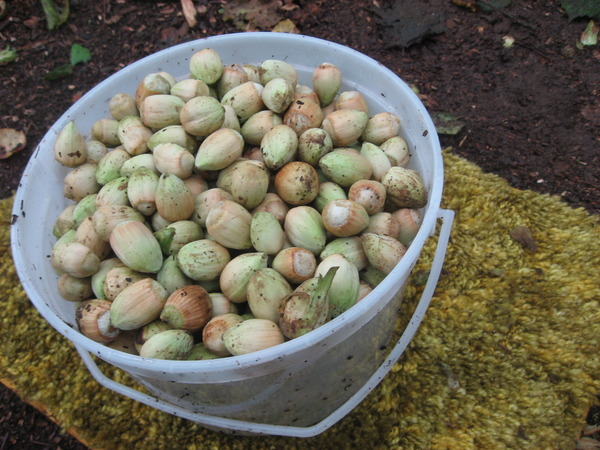 After a short time I had a full bucket of hazelnuts and had the technique down for removing the nuts from the skin. I continued to pick a few more as I waited for Oliver to finish up his bucket. After we both filled our buckets we went back to the house and weighed our nuts. We each picked 5 pounds. At 60 cents a pound that cost us a whopping $3 a piece. 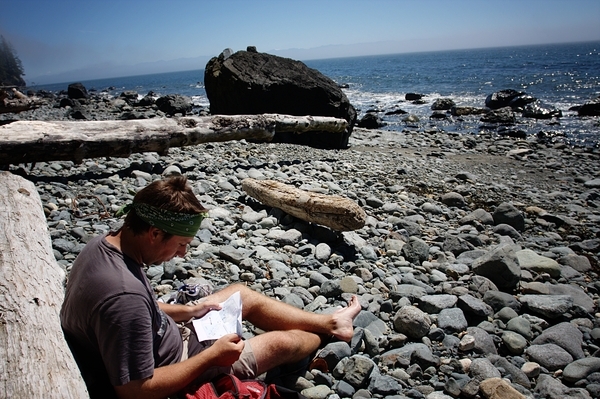 We talked to the owner of the farm for a while about the farm and his other produce. We each bought a few apples (all organic) for again just a few cents a pound, and he gave me a bunch of free plums that were starting to go overripe. It was really a pleasant way to spend a rainy afternoon, and was a real pleasure getting to meet the owner of Garside’s farm. That night when I got home I set out my hazelnuts for drying, and made one amazing plum cake (Pflaumenkuchen). 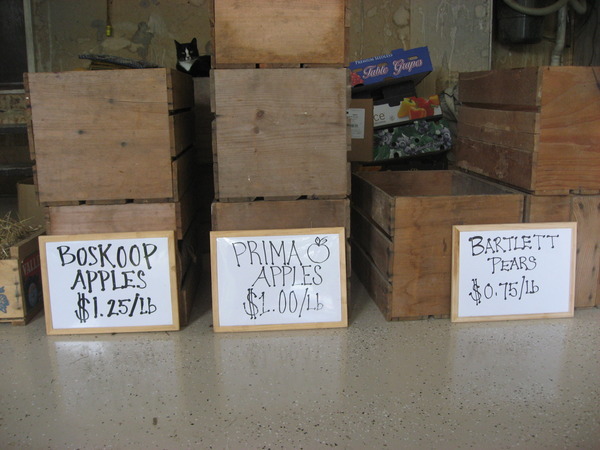 I highly recommend checking out Garside’s Fruit Farm. Not only is it easy to get to, but the owner is extremely nice, and the produce tasty. You and Oliver are so cute with your food adventures. Can’t wait to see you! The “Pflaumenkuchen” was incredible – one of the best I have tasted!